There are lots of uses for a pumpkin. You can gut one, chop a scary face into it and use the slimy contents to make a warming soup, or a refreshing smoothie, a pie, pumpkin bread, or you can even spread it all over yourself to soften your skin! 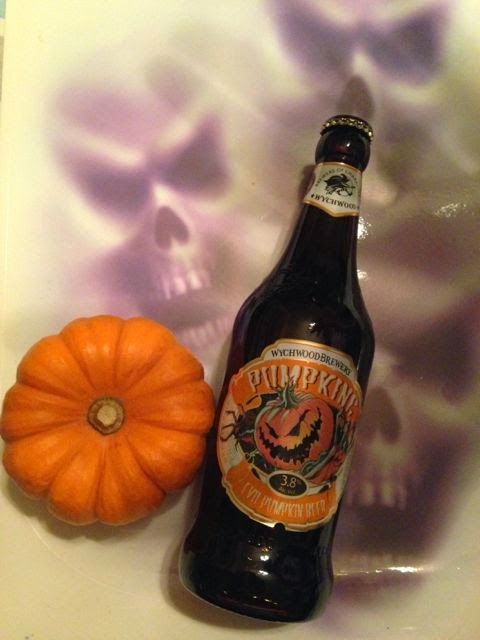 According to Wychwood Brewery the most evil of all pumpkins are saved to make their Pumpking ale. This ruby ale was brewed with (evil) pumpkin and (fairly scary) mace to produce a spicy warming brew to scare away any festive ghouls and ghosts that may creep from the grave on Halloween night and come knocking at your door for sweets and treats, or even blood curdling tricks. On pouring this Pumpking ale there were spicy undertones to the usual ale type smell. The creaminess of this ale and the sweetness from the crystal malt struck me on first taste. I wasn't expecting that almost toffee taste to begin with. I was instantly glad I had a second bottle to enjoy at a later date. The creamy toffee sweetness was quickly followed by the pumpkin flavour, which had mixed perfectly with the bitterness from the mixture of hops and the added spiciness from mace to produce a creamy sweet and slightly fruity spicy then bitter journey that ended on another creamy note to soften the senses. This ale certainly did warm me up, placing me on cushions of creaminess, then dropping a heavy pumpkin on my head before I dozed off (or possibly knocked out) on the cushions. I reckon this was the evil Pumpking's last laugh just to make me jump and remind me that it's Halloween week. So you'd better watch out, evil Pumpkings are about! Brewed by Wychwood Brewery, in Oxfordshire. 500ml bottle at 3.8% in volume.